Ravi Zupa, "Northern Renaissance Lakshmi," 2018, india ink on paper mounted to wood, 24 x 18"
The early industrial disruption of the economies and societies of fifteenth-century northern Europe led to the rise of heretical revolutionary cults. Disaffected workers, led by charismatic gurus, attacked traditional authorities — until the church and state (not always partners) combined to crush them. We’re in such a period today, with authoritarian regimes taking power worldwide — and the credulous mobs march, shouting into the ditch, as in Bruegel’s “The Blind Leading the Blind,” or over the cliff, lemming-style. Ravi Zupa’s previous show, “The Turmoil of Being,” showed the Denver artist to be a master of repurposing traditional, pre-industrial art — Europe, Japan, Tibet and Mesoamerica — to comment on contemporary politics and culture. 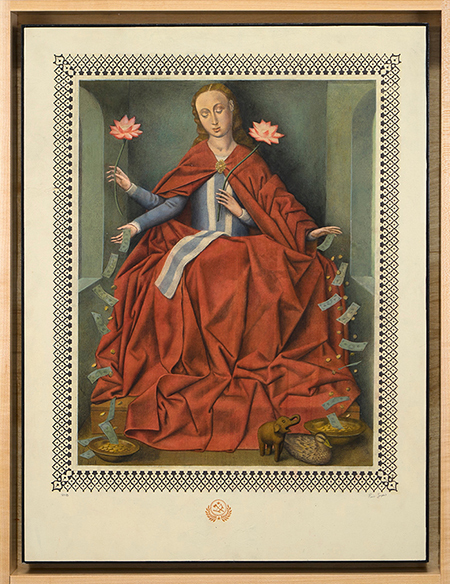 In his current show, “Riches,” Zupa focuses on late medieval and early Renaissance art from northern Europe, namely, the charged, visionary imagery of Dürer, Bosch, Holbein, Bruegel that reflected the tumult of the times through the apocalyptic lens of Christian sin and damnation. A version of Bosch’s “Tree Man,” from “The Garden of Earthly Delights,” thought to contain a self-portrait, appears in “A Prayer During Crisis,” the largest piece in the show, as well as in a couple of the smaller prints, though sporting Hindu masks instead of Bosch’s quizzical squint. Combining such images with contemporaneous images from Indian mythology and contemporary motifs such as skateboards, and roller skates (denoting both activity and risk), Zupa creates in his mixed-media works a transhistorical, transcultural mashup world of people and monsters: a bestiary for bestial times. The forty-four small to medium-sized prints in the show fall into two categories: faux woodcuts on cream-colored paper, faux paintings in color. From the former group, several pairs of images are taken from religious woodcuts. “Thy Smile is Peace: Calm/Frantic,” “Agnostic: Outward/Inward,” “Mad with Attachment: In Public/Alone” and “Be Where Your Hands Are: Lesiure/Labor” are given subversive casts of characters sporting animal or beehive heads, basket or vessel bodies. In the latter group, “Northern Renaissance Lakshmi” portrays a typical northern Madonna, blond, beatific, and elegantly demure, seated in the traditional small chamber used for Annunciations, and dressed in the usual crumpled robe (though red, not blue). She drops bills and coins from her lower two hands and holds lotus flowers in her upper two arms; she’s a goddess of wealth, after all. Also exhibited are five sculptures of military weaponry made from recycled typewriter parts (including platens and shift levers) and stapler parts. “Riches Model 1 Pistol” even features the Remington brand name, a reminder of the product of that curiously diversified company. “Riches” makes the case that our virulent strain of capitalism is as fatal as the misrule of old by Pope and King. Down with us!